I believe that we would be healthier and that the rates of degenerative disease would decline if we all made more soup! Our wise mothers and grandmothers knew the medicinal value of soup. Chicken soup has long been a popular remedy for colds and flu. When I was sick as a child, I felt comforted and nurtured when served a warm bowl of soup prepared lovingly by my mother. Love heals, so do good quality foods and herbs. Medicinal soups are one of the best ways to capture this potential to heal and nurture ourselves and our families. Could something as simple as a pot of soup really hold the secret to health and longevity? Let’s examine the recipe . . . Essential to soup. The action of water, breaking down the other ingredients, makes soups especially medicinal in that they become easily digested and utilized by the body. It breaks the ingredients down by softening the cell walls and circulating through them, extracting all of the vitamins, minerals and other nutrients. The water content of soup is also important for hydrating our bodies. Vegetables, grains, noodles, beans, tofu, meat, fish – the substance of soup. Anything and everything goes into the pot – that’s the great thing about soup. Some of my best soups are made at the end of the week from leftovers, and veggies buried in the back of the crisper. I consider the flavour to be the soul of the soup. Seasonings add flavour and help to draw out the flavour of the other base ingredients. The art of soup making is in the combinations, simple or complex, its all good. Some of my favourite seasonings include miso, seaweeds, nut butters, herbs, and spices. Herbs offer additional nutrition and medicinal properties to soups. I use dry herbs, seaweeds and medicinal mushrooms to make potent stock for my soups. I especially like the mineral rich root herbs such as dandelion, burdock, astragulus, wild yam, ginger, and ginseng. The Chinese have mastered the art of medicinal soups; these and other herbs are common ingredients in their soup pots. Garnishes are fun. Decorate your bowl and add texture with things such as homemade croutons, scallions, cheese, toasted nuts or seeds, toasted seaweeds, sprouts, and fresh herbs. Heat draws out flavour and nutrients. A hot bowl of soup, especially in winter, is comfort food at its best. Hot soup can help to banish sickness and increase vitality. I translate fire as passion. Passion fuels creation. Taking the time to be in the kitchen, to slow down and focus on preparing a hearty meal such as soup, is an expression of passion. Any good cook will agree. I speak from experience, and I am sure you would agree, that food tastes better when it is prepared with love, passion and intention. 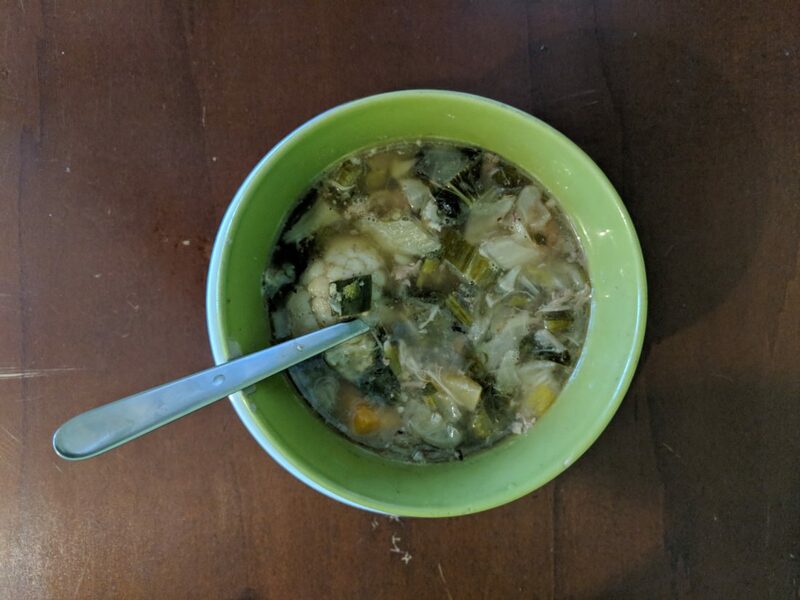 When you consider the fact that soup is a nutrient dense, easily digested, source of energy, and that it costs less than $10 to make a 10 serving pot of soup, how can you afford not to make it a staple in your diet. Make it a weekly ritual. Boil the astragulus and shiitakes for 15 minutes in 5 cups water. Strain the liquid, adding the mushrooms back to the pot. Add the vegetables and seaweed and simmer until tender. Remove ¼ cup of the broth and stir until the miso dissolves. Turn off the heat and add the miso to the pot. Do not boil the miso. You can substitute or add any vegetables you like. Eat 2 bowls weekly to boost immune function and prevent infection. Place barley and vegetables in a pot with water and salt. Cover and bring to a boil. Reduce heat to low and simmer for 40 minutes. Serves four.